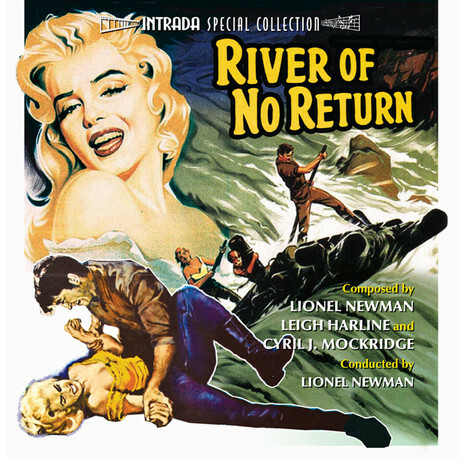 World premiere release of two soundtracks for classic 20th Century-Fox films starring Marilyn Monroe. RIVER OF NO RETURN is 1954 Otto Preminger river journey/adventure tale co-starring Robert Mitchum, Rory Calhoun. Rich, evocative score by veteran Fox composers Lionel Newman, Leigh Harline, Cyril J. Mockridge puts emphasis on action with raft rescues, Indian attacks, more. Presented in solid stereo from excellent condition master elements. Classic title song by Tennessee Ernie Ford appears as well. (Monroe vocals are controlled by another company and were not available for this CD.) NIAGARA is 1953 Henry Hathaway tale of murder set at famous falls, co-starring Joseph Cotten, Jean Peters. Sol Kaplan creates dark, lurid score for orchestra, emphasizing noir-ish climate. Presented in mono as recorded for film. Album produced by Nick Redman, informative liner notes by Julie Kirgo. Lionel Newman conducts. Intrada Special Collection release limited to 1000 copies!